Is it summer yet? The sundresses (and even some sunburn), blockbusters, and strawberries of this past weekend all point to YES. But the weather is still a little rainy and mild for the real summer onslaught, the pools aren't open yet, and I still gotta work on that summer tan. Another way I'll be preppin' is with the Runcible Spoon's Summer Issue & Launch Party! The Runcible Spoon is a rad and quirkly DC food zine whose approach to food is fun and fanciful rather than serious and stuffy. It's completely handmade and the writing and recipes are accented by creative collage and comic-al illustrations. This time around, they've put together a SUMMER SWIMSUIT ISSUE, full of fat and greasy recipes to get you pumped about donning that itsy bitsy teeny weenie yellow polka dot bikini. I'm extra excited about this edition because I was asked to be a contributing writer! I'll be sharin a lil' piece about lard pie crust that's topped with a very heavy, creamy, decadent filling. All that fat (lard is 100%) will really help you float on the ocean waves. The launch party is happening Tuesday (that's tomorrow! 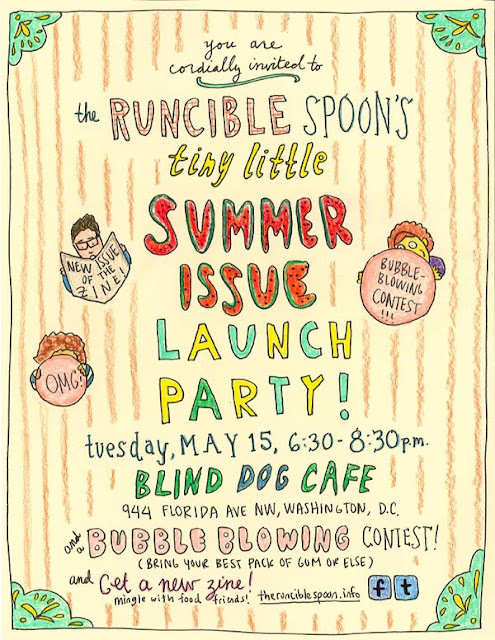 ), May 15th from 6:30-8:30pm at Blind Dog Cafe (944 Florida Ave. NW). There will be a bubble blowing contest (BYOBG), snacks, and new issues for your hot & sweaty little hands. Hope to see you there! Labels: lard pie crust, Washington D.C.